2014-15 Vezina Trophy Winner: Darcy Kuemper? When predicting the candidates for the Vezina Trophy, as best goaltender in the league, the usual names come up. The likes of Tuukka Rask, Carey Price, Henrik Lundqvist, and Jonathan Quick are the usual favourites. Then, there are some secondary guys who have the ability to have a great season and shock the league. Goalies like Cory Schneider, Pekka Rinne, Jimmy Howard, and Ben Bishop have an outside chance. However, through the first two weeks of the regular season, it appears to actually be Darcy Kuemper of the Minnesota Wild leading the Vezina Trophy race. What’s that? You hardly know anything about Darcy Kuemper? Let me fill you in on the possibly budding superstar. Darcy Kuemper was the 161st overall pick in the 2009 NHL Entry Draft, out of Saskatoon, Canada. He played his junior in the WHL with the Red Deer Rebels. In two years, he compiled a .903 save percentage with a 2.84 GAA. He was drafted for his noteworthy size, standing six foot three. The 24 year old was always going to be a project goalie, he had good movement and great coverage of his crease. But, he needed work on his positioning and rebound control. It seems like he may have that under control now. Last year, Kuemper got 24 NHL starts in a year he was supposed to be the AHL starter. However, significant injuries to the Wild goaltending gave him a spot. He also got six playoff starts, before he got into concussion troubles in Game 7 of the first round. Darcy Kuemper has likely seen the last of his days as an AHL goalie. He’s looked like a Vezina Trophy winner through four games in 2014-15, allowing just two goals. 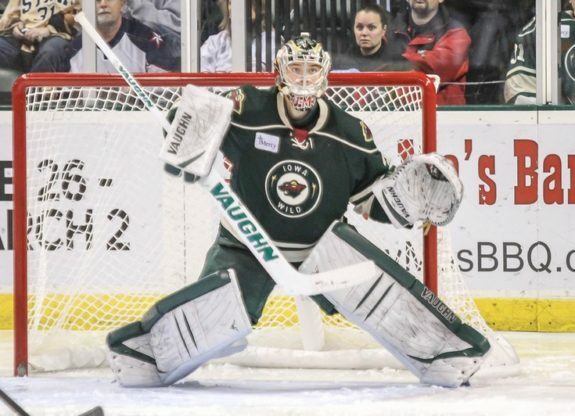 In four starts in the 2014-15 seasons, Darcy Kuemper holds a .980 save percentage and a ridiculous 0.50 GAA. To top it off, he has already amassed three shutouts. The only team to score on him so far were the Anaheim Ducks, who had a breakaway goal and an impossible rebound goal. Kuemper came into the year without playing training camp, as he was dealing with contract negotiations into late September. However, that doesn’t seem to be bothering the early Vezina Trophy favourite, as he’s allowed just two goals in four games. The Minnesota Wild came into the season unsure of their goaltending situation, after Josh Harding went down again with a broken foot from kicking a wall. Now, goaltending seems to be the Wild’s last worry. If anything they should worry about the lack of production coming from their second line. Quick’s acquired the reputation to be good in the regular season and insanely amazing in the postseason. So far this year though, he’s been playing at his usual playoff level. That’s a scary thing for opponents. In six starts so far, he has a .958 save percentage and a 1.54 GAA, with a 4-1-1 record. Quick’s been as flexible and quick as ever, while also not overexerting himself on plays. Often, when he has troubles, it stems from overplaying a scoring situation. This year though, he’s seemed a little more calm. Andersen was supposed to be the backup to phenom John Gibson in Anaheim but, once he was given the reigns, he’s never looked back. Gibson came into the year as a Calder Trophy favourite, but after one bad start, he hasn’t been given another opportunity thanks to Andersen’s superb play. Andersen has a .951 save percentage and a 1.32 GAA in six starts this year. He’s already set an NHL record, winning 26 of his first 31 career starts, perhaps a Vezina Trophy will be his next achievement. After missing most of the 2013-14 season due to injury, Rinne is making sure to make the most of his time. So far, he’s leading a Nashville Predators team that was supposed to be a bottom feeder in the Western Conference into one of the top teams in the league. He has a .939 save percentage and a 1.62 GAA in six starts this year. A few years ago, Rinne was a perennial Vezina Trophy contender. Perhaps, while healthy, he may be returning to that elite status. Pekka Rinne is finally healthy this year and is leading an average team to the top. Kuemper only got this starting role because Josh Harding kicked a wall. Seriously, that’s the reason. With just 32 career NHL starts before this season, the 24-year old is a little new to the situation. However, he’s looked like a veteran so far, always calm and collected in his crease, giving the Wild a chance to win each night. With a .980 save percentage and a 0.50 GAA in four starts this year, he’s been their best player. In fact, he’s only allowed a puck past him in one game this year, collecting three shutouts already. 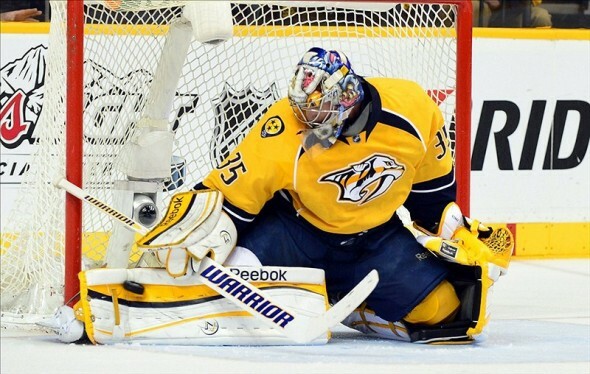 If he keeps it up, a Vezina Trophy could be his in 2014-15.
Who do you think will win the Vezina Trophy in 2014-15? Discuss in the comments below!